1700 The homeowners loved their historic home, with its timber framing and beautiful location in Manchester-by-the-Sea. But the upstairs was cramped and the home suffered from poor drainage (which led to rot), warping (so that doors no longer opened) and problems with the siding. We designed and built a 2-story addition that included a new home office, yet was fully in keeping with the historic style of the home. We improved drainage, including work on the roof and gutters. 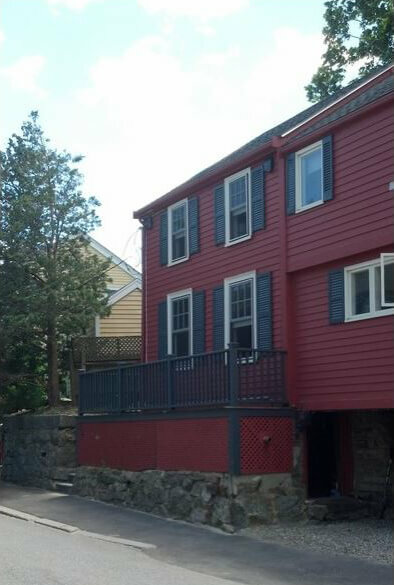 We installed and caulked new trim and clapboards and painted them to match the existing color of the house. Because the integrity of an historic home is as important to us as to the homeowner, we removed the top rails of interior doors before refitting, then restored the rails so that the doors retained their original charm. With a deep appreciation for the natural beauty and fine historic homes on the North Shore of Boston, WORKS by Jesse DeBenedictis specializes in home restoration and renovation projects. Fully licensed by the state of Massachusetts (# CS 91245 and HIC # 178604), WORKS has been creating functional, comfortable living spaces for North Shore residents for over a decade. Manchester-by-the-Sea, Massachusetts offers the perfect combination of natural beauty and fine historic homes designed by and for notables of the 19th century. The town was originally called “Manchester,” but railroad conductors called it “Manchester-by-the-Sea” to distinguish it from all the other New England Manchesters on their route. Manchester-by-the-Sea is home to Singing Beach (where the sand squeaks when walked upon) and Eaglehead, a rock that attracts climbing enthusiasts. Plus, it’s the childhood hometown of Jesse DeBenedictis himself. We have been clients of Jesse and his associates for the past three years, during which time we have begun major remodeling of our entire home. He has completed a complete demolition and remodeling of a bathroom and laundry room. WORKS is proud to work in North Shore towns like Manchester-by-the-Sea, including: Amesbury, Beverly, Boxford, Danvers, Essex, Georgetown, Gloucester, Groveland, Hamilton, Ipswich, Lynn, Lynnfield, Rowley, Marblehead, Middleton, Nahant, Newbury, Newburyport, Peabody, Rockport, Salem, Swampscott, Topsfield, Wenham, Middleton, and West Newbury. Manchester-by-the-Sea, Massachusetts offers the perfect combination of natural beauty and fine historic homes designed by and for notables of the 19th century. The town was originally called “Manchester,” but railroad conductors called it “Manchester-by-the-Sea” to distinguish it from all the other New England Manchesters on their route. Manchester-by-the-Sea is home to Singing Beach (where the sand squeaks when walked upon) and Eaglehead, a rock that attracts climbing enthusiasts. Plus, it’s the childhood hometown of Jesse DeBenedictis himself. WORKS is proud to work in North Shore towns like Manchester-by-the-Sea, including: Amesbury, Beverly, Boxford, Danvers, Essex, Georgetown, Gloucester, Groveland, Hamilton, Ipswich, Lynn, Lynnfield, Rowley, Marblehead, Middleton, Nahant, Newbury, Newburyport, Peabody, Rockport, Salem, Swampscott, Topsfield, Wenham, Middleton, and West Newbury.